Friday rides may be the best rides. When the weather is right, there is nothing like a smooth, easy paced ride on the coast, a strong espresso, and maybe, if you’re lucky, a slice of pumpkin bread to top it off. And don’t forget the good company! I was thinking back just the other day to when I first moved here five years ago. I lived very close to our coffee ride starting spot in Aviara, and I used to ride the route to Oceanside Harbor and back each week… by myself. A lot can change in five years! 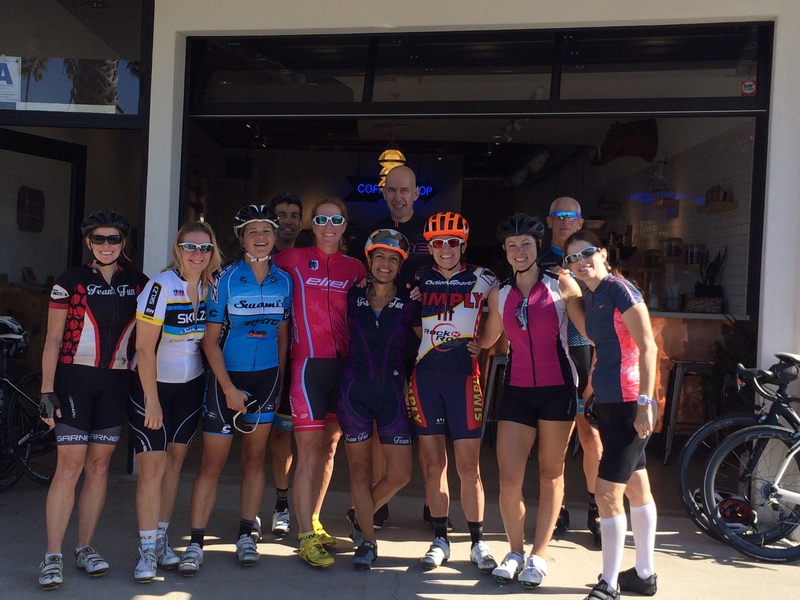 This week we hit Revolution Roasters on the Coast Highway in Oceanside. Jill, Heather K and I are very familiar with this coffee, having been long time Friday regulars at was once called Cafe Ipe (and is now called Coffee Coffee) in Leucadia. This spot had plenty of room, and as you can see, I had a nice slice of pumpkin bread to enjoy along with my perfectly dark yet smooth americano. In terms of room for bicycle parking, interestingly, a city official came in to speak with us about the group we were with, and he said he was just so happy that we used the new bike parking out front. He said he worked hard to get those put in, and is working hard to get the four lanes on Coast Highway down to two with wide bike lanes on each side to encourage bike traffic through the downtown. He was also glad to see that we were stopping in downtown Oceanside! Each week we choose a different coffee spot to hit, and this has been the fourth so far on our list. We rotate between heading north on the coast and south, but we have been consistently starting around 9:00 am in the Ralph’s shopping center parking lot off Avenida Encinas. 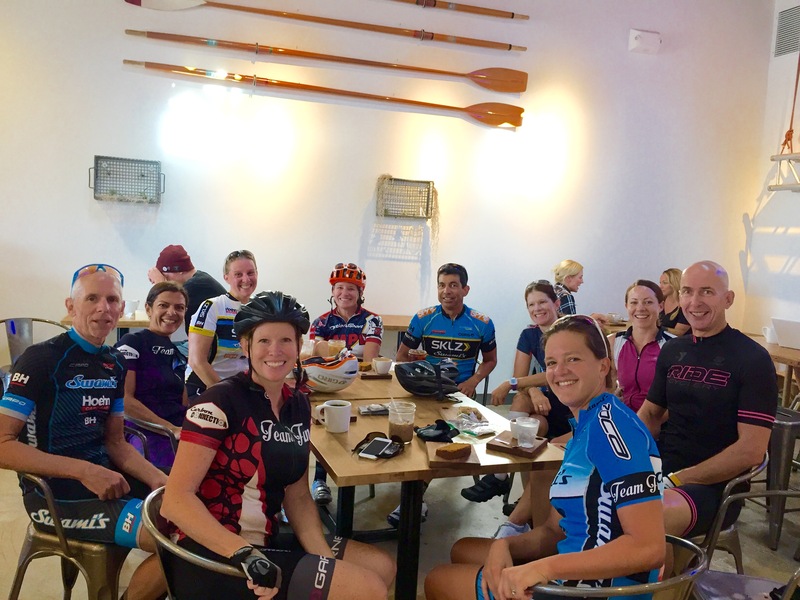 We generally have a great mix of new and experienced riders, and with ride lengths in the 20-25 mile range, it’s a nice Friday ride for everyone. We did have a bit of a small mishap on the way home, with Troy’s pedal coming loose from his crank. There happened to be someone near by with enough tools that somehow, they got it fixed. 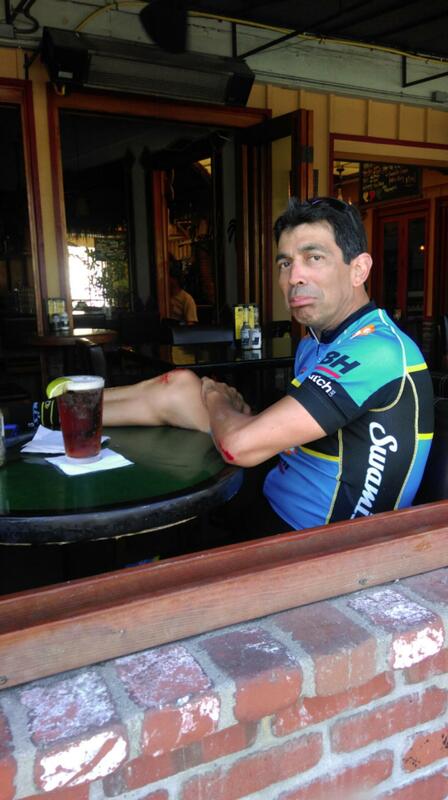 Troy got a little banged up, but a little after-coffee beer seemed to help ease the pain. You might have noticed a bright blue Swami’s Kit with “Team Fun” on the left arm band in some of the pictures above. That is in fact the 2016 Women’s Swami’s kit, and the link from the Swami’s members site to Nytro for ordering just became active today. We will need to place our orders by October 31 (that’s next Saturday), so make sure you check it out. If you can ever make it on a Friday morning, be sure to join us!